The road signs provide important information about road and traffic to drivers for safety driving. These signs include not only common traffic signs but also the information about unexpected obstacles and road constructions. Accurate detection and identification of road signs is one of the research topics in vehicle vision area. 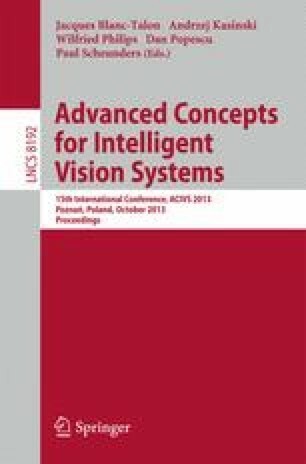 In this paper we propose a stereo vision technique to automatically detect and track road signs in a video sequence which is acquired from a stereo vision camera mounted on a vehicle. First, color information is used to initially detect the candidates of road signs. Second, the Support Vector Machine (SVM) is used to select true signs from the candidates. Once a road sign is detected in a video frame, it is tacked from the next frame until disappeared. The 2-D position of the detected sign on the next frame is predicted by the motion of the vehicle. Here, the vehicle motion means the 3-D Euclidean motion acquired by using a stereo matching method. Finally, the predicted 2-D position of the sign is corrected by the template matching of a scaled sign template in the near regions of the predicted position. Experimental results show that the proposed method can detect and track road signs successfully. Error comparisons with two different detection and tracking methods are shown.